"Obama can be linked to Democratic Socialists of America"
Democratic Socialists of America (DSA) is the largest socialist organization in the US. It is one of two official U.S. affiliates of the Socialist International. It was formed in 1982 from a merger of the Michael Harrington led Democratic Socialist Organizing Committee and the smaller New American Movement. DSA works inside the Democratic Party and has cross membership with the Communist Party USA, Committees of Correspondence for Democracy and Socialism, Socialist Party USA and the Green Party USA. DSA has close ties to the radical Institute for Policy Studies, ACORN, Jobs with Justice, Congressional Progressive Caucus and publications including Dissent, The Nation and The American Prospect. While not overtly so, Democratic Socialists of America is essentially a Marxist organization. In an article in DSA's Democratic Left, Spring 2007, DSA National political Committee member David Green of Detroit wrote in support of the Employee Free Choice Act (EFCA)-or "card check". Barack Obama makes an apparent reference to the Socialist Scholars Conference in his 1995 autobiography "Dreams From My Father". For many years, from the early 1980s until 2004, Cooper Union was the usual venue of the annual Socialist Scholars Conference-almost certainly what Obama was referring to. Socialist Scholars Conference-now known as Left Forum was for many years the largest socialist gathering in the USA, attracting up to 2,000 participants. 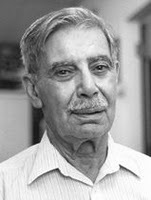 Socialist Scholars Conference was founded by a group of radicals from City University of New York led by sociology professor Bogdan Denitch, as well as chairing the Socialist Scholars Conferences since 1980, Denitch is an Honorary Chair of the Democratic Socialists of America and has served as DSA's representative to the Socialist International. Since DSA's formation in 1982 its City University branch has sponsored and organized the Socialist Scholars Conference. The bulk of SSC's organising committees were have been DSA members, as were many conference speakers. Other speakers came from the Communist Party USA and its offshoot, the Committees of Correspondence, the International Socialists and Freedom Road Socialist Organization as well as independent Marxists, Maoists, Trotskyites, black radicals, gay activists and radical feminists. Barack Obama wrote of "conferences" plural, indicating his attendance was not the result of accident or youthful curiosity. Barack Obama's first known contact with Chicago Democratic Socialists of America occurred in 1992, shortly after he returned to Chicago, from his studies at Harvard. Barack Obama observed that Martin Luther King's March on Washington in the 1960s wasn't simply about civil rights but "demanded jobs as well". One of the themes that has emerged in Barack Obama's campaign is "what does it take to create productive communities", not just consumptive communities. It is an issue that joins some of the best instincts of the conservatives with the better instincts of the left." Obama felt the state government has three constructive roles to play. The first is "human capital development". By this he meant public education, welfare reform, and a "workforce preparation strategy". Public education requires equality in funding. It's not that "money is the only solution to public education's problems but it's a start toward a solution... A true welfare system would provide for medical care, child care and job training. While Barack Obama did not use this term, it sounded very much like the "social wage" approach used by many social democratic labor parties." The state government "can also play a role in redistribution, the allocation of wages and jobs. As Barack Obama noted, when someone gets paid $10 million to eliminate 4,000 jobs, the voters in his district know this is an issue of power not economics. The government can use as tools labor law reform, public works and contracts." Finally, Illinois "needs an industrial strategy. How do we create more jobs for everyone? Illinois has no strategy for encouraging high wage, high productivity jobs". 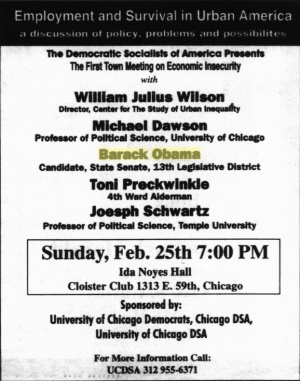 Chicago Democratic Socialists of America endorsements in the March 19th 1995 Primary Election went to Danny K. Davis, Patricia Martin, Willie Delgado and Barack Obama. ...certainly not foreign to Chicago DSA. From the very beginning, he has always been willing to help: appearing as a speaker with Michael Harrington, serving as a Master of Ceremonies without peer at the annual Debs - Thomas - Harrington Dinner. ...not as the full fledged Democratic Socialists of America member he actually was. Barack Obama was given an extensive profile that covered his work with Project Vote, Developing Communities Project and Annenberg Challenge Grant, his education, community activities, education and work for Judson Miner. Mr. Obama graduated from Columbia University and promptly went into community organizing for the Developing Communities Project in Roseland and Altgeld Gardens on the far south side of Chicago. He went on to Harvard University, where he was editor of the Harvard Law Review. He graduated with a law degree. In 1992, he was Director of Illinois Project Vote, a voter registration campaign that made Carol Moseley Braun's election to the U.S. Senate much easier than it would have been. At present, he practices law in Judson Miner's law firm and is President of the board of the Annenberg Challenge Grant which is distributing some $50 million in grants to public school reform efforts. Luckily, Mr. Obama does not have any opposition in the primary. His opponents have all dropped out or were ruled off the ballot. But if you would like to contribute to his campaign, make the check payable to Friends of Barack Obama, 2154 E. 71st, Chicago, IL 60649. Founded in 1961 and still active, the Chicago Committee to Defend the Bill of Rights is one of the Communist Party USA's most successful and enduring creations-playing a major role in the near elimination of police spying against radical organizations. In the early years Chicago Committee to Defend the Bill of Rights' personnel were virtually, all proven members or sympathisers of the Communist Party USA. In later years, supporters of the New American Movement, Democratic Socialists of America and Committees of Correspondence for Democracy and Socialism were more prominent. In the 1970s, prominent members of the organization included Quentin Young, Timuel Black and Rabbi Arnold Jacob Wolf. All three went on to join Democratic Socialists of America. All three went on to become friends and supporters of Barack Obama. Chicago activist Adrian Bleifuss Prados, of Democratic Socialists of America youth wing, the Young Democratic Socialists wrote on their blog The Activist January 29, 2008, on the relationship between Obama, and Illinois Congresswoman Jan Schakowsky. Prados describes Schakowsky as "DSA friendly", but she has in fact been a paid up member of the organization. Quentin Young is a long time member of Chicago Democratic Socialists of America. 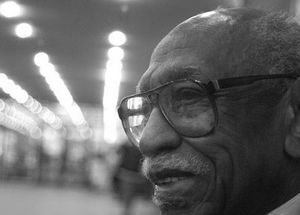 Timuel Black is an historian, activist and nonogenarian icon of the Chicago left. 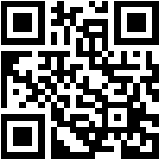 Black is a veteran of the Socialist Party USA and Democratic Socialists of America. For several years he has also served on the Committees of Correspondence advisory board. In 1995 Timuel Black attempted to mediate a dispute between Illinois State Senator Alice Palmer and her chosen successor Barack Obama. Timuel Black was involved in Obama's campaign committee during his successful 2004 U.S. Senate race. In 2000, Rabbi Arnold Jacob Wolf was named as a member of Democratic Socialists of America in the DSA publication Religious Socialism. In April 2008 Rabbi Wolf sent a "Shalom" to Chicago DSA's 50th annual Eugene V. Debs - Norman Thomas -Michael Harrington Dinner. The famous 1995 meeting In the home of Bill Ayers and Bernardine Dohrn, that launched Obama's political career was apparently one of several functions designed to introduce Obama to the Hyde Park set. Around this time, Obama started to attend a series of coffees in the Hyde Park community where he lived, standard operating procedure for political rookies running in the neighborhoods surrounding the University of Chicago. In 2008, Rabbi Wolf was a member of Rabbis for Obama, he has held Obama fundraisers in his home and was a big fan of the then Senator from Illinois. Wolf came to Hyde Park before urban renewal. For 25 years he led the congregation at KAM Isaiah Israel, a synagogue across the street from Obama's mansion. "Barack is perfect for the neighborhood!...You can't say Barack's a product of Hyde Park. He's not really from here. But everybody saw the potential early on. We had a party for him at our house when he was just starting, back in the Nineties. I said right away: 'Here's a guy who could sell our product, and sell it with splendor!' "
On "the product" Obama could sell? "The thing is, it's not what you might think...It's not radical. It's not extreme. It's a rational, progressive philosophy based on experience. You see it here. This neighborhood is genuinely integrated. We did it here, we really did it! Not just talk about it. Look around. And Barack and his family fit right in. This is their neighborhood." Danny K. Davis is the only Democrat remaining in Congress who is open about his membership of Democratic Socialists of America. 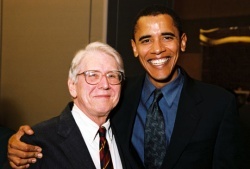 Davis' friendship with Barack Obama goes back at least to their days in the DSA influenced New Party in the mid 1990s. Danny K. Davis joined the Chicago New Party (along with Barack Obama ) during his successful Congressional 1996 campaign on the Democratic Party ticket. An Obama presidency will not on its own force legislation facilitating single-payer health care (at least at the federal level) or truly progressive taxation and major cuts in wasteful and unneeded defense spending. But if DSA and other democratic forces can work in the fall elections to increase the ranks of the Congressional Progressive and Black and La-tino caucuses, progressive legislation (backed by strong social movement mobilization) might well pass the next Congress. Around December 2013, while coping with his cancer, long time DSAer Tim Carpenter's daughter ran up to him with an envelope from the White House that had arrived in the mailbox of the family's Florence, Massachusetts, home. When they opened it, there was a note from President Barack Obama, wishing Tim well while celebrating his resilience. Senator Barack Obama, founder New American Agenda Project, was on the list of 129 speakers at the 2005 Take Back America conference, which was organized by the Institute for Policy Studies, and Democratic Socialists of America dominated Campaign for America's Future. Obama spoke again in 2006,2007. "Before debating health care, I talked to Andy Stern and SEIU members. Before immigration debates took place in Washington, I talked with Eliseo Medina and SEIU members." Medina serves as an honorary chair of Democratic Socialists of America. Formed in early 2008 Progressives for Obama was desined to unite the main sectors of the U.S. left behind the Obama presidential campaign. Of the four main founders, two Bill Fletcher, Jr. and Barbara Ehrenreich are senior members of Democratic Socialists of America. Of the website's endorsersPaul Buhle, Duane Campbell, Peter Dreier, Adam Hochschild, Jay Mazur, Frances Fox Piven, Christine Riddiough, Stanley Sheinbaum, Cornel West and Betty Willhoite have been Democratic Socialists of America members. Most Democratic SA locals committed themselves fully to the Obama campaign in 2008. Sacramento DSA worked intensely on the Obama campaign through Super Tuesday and continues electoral work with the Sacramento Progressive Alliance. In Columbus, Ohio, DSA members campaigned for both Obama and congressional candidate Mary Jo Kilroy, who, after a suspenseful count of provisional ballots was declared the winner in December, raising the Democrats’ majority in the House to 257. During Obama's 2008 presidential cycle at least three DSA connected activists were appointed to important campaign posts. Harry Boyte Co-chair of the Civic Engagement Group of Barack Obama’s U.S. presidential campaign. 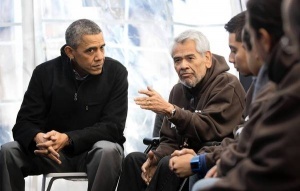 Eliseo Medina Served on Obama's Latino Advisory Council. Cornel West Served on Obama's National Black Advisory Council. Jose LaLuz also served as president of Latinos for Obama. The Obama administration has appointed several people with Democratic Socialists of America connections to key government positions. President Barack Obama told about 20 hunger strikers on the National Mall on Nov. 29 2013, that he supported their effort to pressure House Republicans to overhaul immigration laws but was concerned about their health. Three of the protesters, including labor leader and Democratic Socialists of America member Eliseo Medina, 67, have not eaten for 18 days and are drinking only water. Obama and his wife, Michelle, met with the group for about 30 minutes in a heated tent near the steps of the Capitol to discuss the immigration bill that has stalled in the House. "He was really concerned about our health," said Christian Avila, 23, a student from Arizona who stopped eating on Nov. 12. "He said we might think about handing the torch over ... and taking a break." Avila — who wore a brown hooded sweat shirt that read "Act. Fast." — said he planned to avoid eating as long as he could. Obama told the group that he had instructed his staff to figure out what else they can do to get an immigration bill to his desk. He said he believes Congress eventually will change the law to allow people in the country without documentation to work and live legally in the U.S.
"It's not a mater of if, but when," the president said, according to Avila. The hunger strikers also have been visited by Vice President Joe Biden, Agriculture Secretary Tom Vilsack and Labor Secretary Thomas Perez. Two House Republicans from California, Jeff Denham and David Valadao, who support passing an immigration bill in the House, also have stopped by. Shortly after the Obamas' visit, one time DSA member Kathleen Kennedy Townsend, daughter of the late Robert F. Kennedy, stopped by to sit with the fasters. In 1968, shortly before he was assassinated, her father visited Cesar Chavez in Delano, Calif., where the labor leader was fasting to bring attention to the working conditions of farmworkers. "There is a moral quality to what kind of country we are," Townsend said after meeting with the protesters. "That is what my father believed.... This is about real people and their lives."